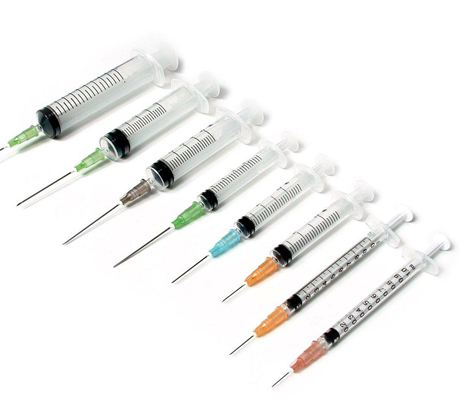 In medical profession a syringe plays an important role, it is a simple pump consisting of a plunger that fits tightly in a tube and the plunger can be pulled and pushed along inside a cylindrical tube which allows the syringe to take in and expel a liquid or gas through an orifice at the open end of the tube that may be fitted with a hypodermic needle, a nozzle or tubing. There are various types of syringes which a medical professional can use according to the demand of the situation. These syringes are reusable syringes, disposable syringes, prefilled syringes and safety syringes. Medication through the disposable syringes is the best way to avoid infection. These syringes are safe to use and can be used only once. It is necessary for you to use a new needle or syringe each and every time you are inject. Syringes are not designed to be used more than once and you should avoid sharing a needle, syringe or cotton with anyone. Earlier when medication system was not that much developed; reusable and sterilized syringes were used but now in the modern and advanced time better options of medication through disposable syringes are available. Disposable syringe are most commonly used for the extraction of blood as it is an essential part to diagnose any disease of the patient with the help of sample collecting (blood test) from the body of the patient. These syringes are used to avoid the risk of infection from one patient to another. If we use the same syringe to another patient with which we collected the sample of the patient who is infected with hepatitis, if the patient was not affected with that disease will also suffers from hepatitis only because of that infected syringe. An inappropriately sterilised syringe is a potential source of disease so we have to avoid reusing syringe. The reuse and improper sterilization of syringes present significant risk in transmission of blood borne pathogen due to this reason health care agency should have to use disposable syringes. This shown in a survey that up to 30% of injections for immunisation in developing countries are not sterilized. To avoid this critical situation Solo Shot; a plastic disposable syringe equipped with an internal mental chip is used with the help of which after permitting a single filling or injection, the chip locks the plunger and prevents refilling. It is highly appropriate for use in immunization by reducing wastage and improving injection safety. Injecting of insulin by a diabetic person is also done with the help of disposable syringe. Insulin syringes are for measuring and administering insulin only they should not be used to measure or administer oral medications. Reusing of the insulin syringe is not that much harmful as sharing needles because the same person is using that syringe; but there is still a risk as the person is already suffering from an infection that’s why he has weak immunity system. Due to the weak immunity he will invite more disease or infections so you can use alternative method such as insulin pens which have grown popular and effective or stop reusing syringe. It is also used for administering a local anaesthesia by dentist. Local anaesthesia is obtained by placing a drug near the sensory nerves to temporarily prevent the conduction of pain impulse to the brain with the help of disposable syringe. First local anaesthetic syringe was introduced by cook laboratories in 1921 after that considerable improvements have been made and the most important improvement is the addition of the aspirating harpoon.